Yelling ‘Shark’ Proves Profitable, Again and Again and…. It’s one of the most hallowed times of the year: Discovery Channel’s Shark Week. 26 hours of blood-thirsty teeth gnashing that ISN’T the network execs. Starting two weeks earlier with 7 more hours of programming than last year, June’s event has even more prominence it seems, as the creators continue to turn the block programming into a brand itself. Yes, you can buy Shark Week everything, from apparel and t-shirts to Megalodon teeth. 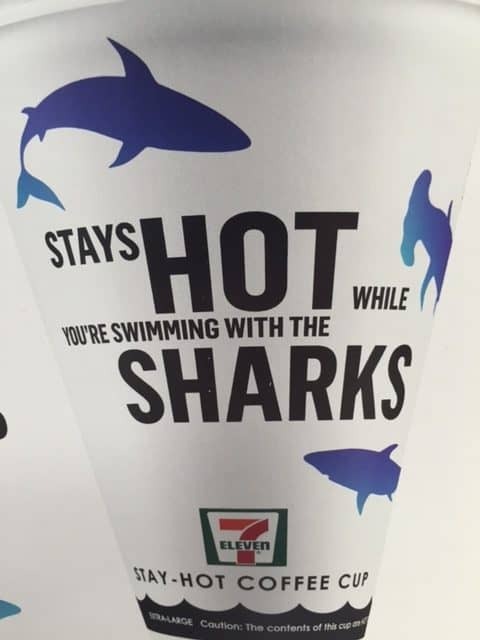 And a 7-11 tie-in features Shark Week donuts, cups, and special shark-mouth slurpee straws. Killer execution, gang. The dozens of companies using Shark Week as a promotional tool for products, and profits, as well as the social media frenzy via viewers, make it easy to see the buzz momentum. Some companies may even be programming around Discovery. Blake Lively stars in Columbia Picture’s just-released The Shallows, indirectly opening Shark Week. Both help each other in this eat-or-be-eaten world of media, with the movie featured on Discovery’s website alongside tips on surviving a shark attack, conservation efforts, and the official trailer. And if sitting in front of the TV bores your beach-loving self, you can enjoy Shark Week in the comfort of your own virtual reality. Just download an app for your device and you’re well on your way to swimming with sharks. This bridge between technology and television not only provides an even more amazing way to experience this week but also another marketing tool to bring in the adrenaline junkies and tech fans from across the globe. No other station has a week dedicated to one subject as impressively successful. Animal Planet’s Monster Week sinks in comparison, in both free advertising and viewers. So Shark Week keeps moving forward, like, well, sharks. What are the implications of all this Shark Shtuff? Theoretically, it’s supposed to bring awareness to some of the world’s toothiest creatures. 2.5 million people enjoyed Shark Week last year, but many companies are staking a claim in advertising for the most wonderful week of the year. Could it be that viewers would rather get behind the hype of this week than shark conservation? Either way, it keeps Shark Week from sinking.